Gearset will begin a check-only deployment to your selected org. Nothing will be deployed to your org at this stage. If anything goes wrong - for example, the deployment fails or tests don’t pass - we’ll show you exactly what happened so you can fix it. For advanced users, you can also specify the level of testing (learn more) you would like to carry out using the arrows on the Validate deployment button. Once the validation completes you'll be shown the validation success screen. At this point, the package will automatically be saved into your Validation history. Note: you can't create a validated package when deploying to a source control repository. From the validation successful page, click Deploy now to begin immediate deployment of the package. Just like when validating, you can also specify whether to run tests when deploying by using the arrow options on the Deploy now button (learn more). If your org supports Salesforce quick deploy, and you ran tests when validating your package, Gearset will attempt to deploy your package without re-running tests. This can make the deployment much faster than the initial validation. Note: when a package is deployed, it is removed from your validated packages history and the entry is added to your deployment history. 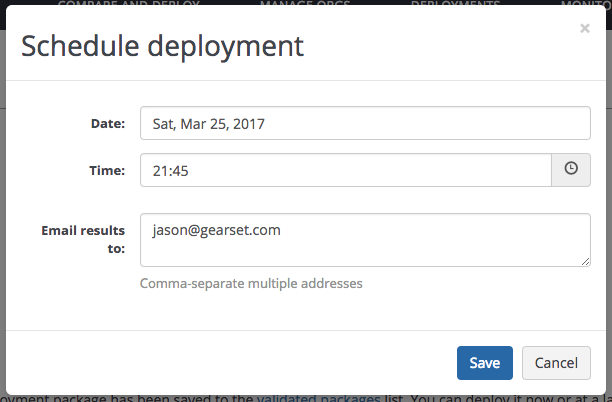 Gearset can automatically deploy your validated package at a specified date and time, and send you an email when the deployment is complete. This means you don't have to be there to press deploy if you have a scheduled maintenance window. To change the time for a schedule deployment, click the Schedule button again. To remove the scheduling, click the red cross icon next to the scheduled time. Validated packages are shared with other members of your team in Gearset, and those created by team members will appear in the results alongside your own. If you have set up the requisite org permissions and shared access, you can collaborate on validated packages, inspect packages created by others, and even deploy them. See the the guide on teams and sharing for more information. A number of actions can be performed from the Actions column. The actions depends on the validation status. Delete: delete the validated package from your history - this can't be undone! You can search for items in your history using the search box above the table of results. By default, the validation history will display validations carried out in the last 10 days. You can change this filter view by clicking on the date range to the right of the filter box. The results can be sorted by column by clicking on a column header - by default they are sorted by date, with the most recent at the top. You can also filter the history by validation status. 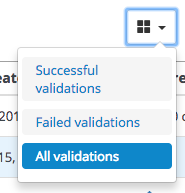 You can view all validations (default), or only successful or failed. Packages are based on snapshots of your environments created at the comparison stage. This means any changes in your orgs that happen between package creation and deployment won't be accounted for, and could be overwritten when the package is deployed. In addition, Salesforce currently enforces a 10 day window on the quick deploy feature. Deploying a package outside of the 10 day validity window will mean tests will have to be re-run on deployment. To reduce the chance of orgs changing under your feet, and to make the most use of the quick deploy feature, Gearset validated packages expire 10 days after creation. The expires in column in the results show how long until a package expires. We recommend you deploy any validated packages within the 10 day window. You can, however, schedule and deploy them outside of this window, but will be shown a warning before confirming the deployment.